At this time of year, when many Americans are enjoying the spirit of the holidays and all the merriment that entails, business owners are hard at work making sure that this year ends on a high note and the next one starts off on the right foot. As 2019 nears, it's time to begin planning out your restaurant's goals, initiatives to move you closer to achieving those goals, and budget to power the whole shebang. While it's natural for your attention to veer toward inventory optimization, operational cost-savings, and labor management, it's important you don't overlook how you plan to market your restaurant to new and existing customers. A well-rounded restaurant marketing plan is key to enticing and engaging your target customers. Let's dive into the need-to-have's on your 2019 restaurant marketing plan. According to Toast's 2019 Restaurant Success Report, both newly opened restaurants and restaurants who saw annual profit growth in 2017 were more likely to Facebook and Instagram when marketing their business on social media. In 2017, 73% of restaurateurs surveyed chose Facebook as their preferred social media platform while 18% cited Instagram; in 2019, the number of restaurateurs who chose Facebook slipped to 68% while those who chose Instagram increased to 24%. When using social media to market a business, owners and operators have the choice between using organic (or free) posting or paid posting (advertising). A recent study found that 63% of restaurants ranked social media advertising as their most-used form of paid advertising. Luckily, creating an ad on Facebook or Instagram is as easy as the click of a button. 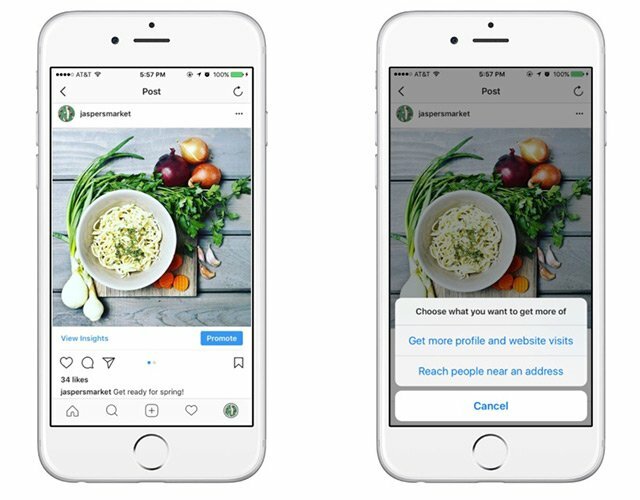 Simply go to your restaurant's Facebook or Instagram page, find the post you would like to turn into an ad, and click the blue 'Boost' (Facebook) or 'promote' (Instagram) button. You will then be taken to a screen where you can decide how much money you would like to spend, who you would like your ad to target, and how many days you would like this ad to be live for. Facebook has a page dedicated to helping your restaurant's Facebook business page get started with ads, including how to make an ad, how to choose an audience, and how to select a budget. Start making noise with your social media posts, and remember: a little bit of ad spend can go a long way on social media. Google is there to help us answer any and every question you could possibly think up, like what time does McDonald's stop serving breakfast (hint: they don't) or who invented bread. Google sees 3.5 billion searches per day, and your guests – both potential and existing – patrons are avidly searching phrases like "food open near me" and "local restaurants delivering now." Filling out your restaurant’s Google My Business page and, when appropriate, bidding for ad placement Google Adwords helps your restaurant be front and center when people search for nearby dining options. According to Statista, worldwide smartphone usage is only on the rise. This means the number of people searching for restaurants on the go will only continue to grow. Ensuring your restaurant Google My Business listing is ready to go when people search for food near them is a key to restaurant success in 2019. A restaurant is not so much a business as it is a micro-community, where the strong, familial relationships that exist between management, staff, and guest are forged with exceptional hospitality and great guest experiences. It should come as no surprise that this flair for hospitality extends beyond the four walls of a typical restaurant: many in our industry regularly take part in charitable giving and sponsoring events in their local community. In fact, 68% of restaurantsengaged in some sort of charitable giving or event sponsorship in 2017 according to a recent study, making it the second-most popular advertising method for restaurateurs. Besides being good for the soul, charitable giving is also a great marketing tool: The Nielsen Company found that 66% of the global millennial population are willing to pay more to support brands “committed to a positive social and environmental impact." There are a variety of ways your restaurant can partake in community events sponsorship and charitable giving. One example is working with local schools and organizations for a give back night. Give back nights occur when your restaurant agrees to sponsor a group in exchange for increased business. In the example above, Chili's worked with a local high school sports team. Members of the team distribute the flyers in school and around town, encouraging community members to visit Chili's. Chili's, in turn, donated 10% of the sales directly driven by the event back to the team. Both groups won – the team earned funds and the restaurant saw increased business. Sponsorship can earn your brand placement at sports games and concerts and can even gain media attention. The spectrum of restaurant sponsorship is so vast that almost everywhere you look there's an opportunity to take. Video is an important element of restaurant marketing – and it's not just reserved for old fashion television. The ROI of video advertising can be difficult to justify for smaller restaurants. Instead of filming big budget commercials and spending thousands on television ads, consider using your smartphone to shoot alluring footage of your food and post it on Facebook, YouTube, or Instagram for free. With the creation of Instagram stories, you can also tap into the power of video advertising by broadcasting video content to your pre-existing follower base. If you're hosting an event, get on Facebook live or Instagram live to give the world a peek; if you're hosting a giveaway or contest, you could announce the winners on Facebook live or Instagram and offer all viewers a special promotion or discount code to use on their next visit. If video isn't your forte, ask your customers to post some video at your restaurant and then re-purpose it on your social channels with their permission. User-generated content can be a huge asset for your online branding and reputation. Direct mail advertising is not dead, so it should definitely be in your 2019 restaurant marketing plan. Nearly half of millennials in the U.S. look forward to checking their mail every day. The response rate to household direct mail ads is 4.4% – compare that to the 0.6% (or less) response rate for digital ads and direct mail doesn’t seem six feet under anymore, does it? What’s even better is that $167 of direct mail budget can lead to $2,095 in sales. Scheduling regular menu sends to local universities and office complexes or acquiring mailing lists from sources like Valpak for semi-annual mailings can still be effective. Give direct mail another chance in 2019 if you thought it was dead – you might be pleasantly surprised with the results. Keep in mind, this is not a definitive list of restaurant marketing channels to use to get the good word out about your business. For example, if your target customer's age demographic skews older, maybe newspaper ads are still a wise choice to produce ROI on your marketing activities. Have magazine ads proven effective in the past? Keep at it. Just make sure you document these activities, your projected budget, and your timeline in your 2019 restaurant marketing plan. Now that you know what to include in your 2019 restaurant marketing plan, download Toast's free informational marketing ebook and customizable templates below!